Which is pure indulgence and the ultimate luxury facial which your skin will ever experience. 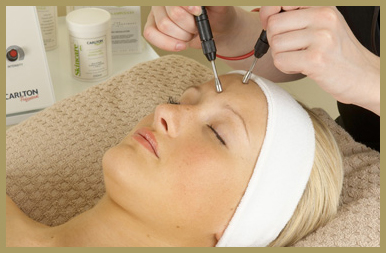 Cost £95.00 (please see Endo Face and Lift Professional sections for more details). The skins tissues and its underlying structure are the only one you get during your life. These, like any other appliances / machinery that we use regularly need care, attention and servicing to maintain their high performance. This is where our specialist treatments are of great benefit which should be used as a preventative treatment as well as a corrective one. The skin is the largest organ of the body and is made up of several layers. As age progresses the skin tissues and underlying muscle structure change in many ways. From the age of approximately 25 years onwards deterioration commences. It starts becoming finer and drier as its collagen and elastin contents decreases, leading to loose crepe appearance retaining many fine lines such as crow’s feet etc and showing lack of firmness and tone. Its texture and appearance becomes less smooth and the complextion dulls. Sometimes there are changes in pigmentation and tiny thread veins begins to appear around the nose and cheeks. The activity of cellular regeneration slows down as the ageing process continues, meaning that the old cells are not renewed as quickly as they once were in our youth. Other factors are involved, such as our general health, dietary habits and exposure to the elements all contribute to the ageing process. By modifying some of the above and using the help of our range of specialist treatments you can aid in the repair of the skins collagen layer and help to restore the skins natural elasticity, tone and texture. With our specialist facial treatments we can offer the contouring of the face by re-programming the muscle fibres, it can shorten or relax the fibres (depending which parts of the muscles on the face which we need to perform this procedure) thereby helping to lift sagging muscles of the jaw line, neck and face helping to reduce and smooth the fine lines and wrinkles on the face and neck, these treatments also increases circulation, therefore improves skin tone, texture and colour and can improve the condition of scar tissue. We must remember that the skin on the face and neck is attached directly to the underlying muscles. When these underlying muscles sag, the skin on the face will do the same. FREE CONSULTATION - I would like to book a treatment or a free consultation? You are more than welcome to telephone and book a treatment or a free private consultation where we can discuss your specific requirements and explain the treatment procedure in more detail. All treatments are provided in a private environment on a one-to-one basis.